There are few earthly pleasures I enjoy more than good food. One of my favorites is fresh bread, hot out of the oven. The aroma, the taste. Are you picturing it? I’m getting hungry just thinking about it. The day after Jesus fed the 5000, some of those people had sought Him out again. He told them that they came after Him because they had eaten the bread. Then, Jesus added the idea that they shouldn’t pursue food that perishes. Such food wasn’t truly worth the effort. Instead, He told them, go after “food that endures to eternal life, which the Son of Man will give to you” (John 6:27). Jesus went on to contrast the manna that the Lord had given to the people of Israel with the “true bread from heaven.” He then made a pretty radical statement: “For the bread of God is he who comes down from heaven and gives life to the world” (vs. 33). Jesus is talking about Himself as bread, the true bread from heaven. He even goes on to say, “I am the bread of life; whoever comes to me shall not hunger…” (vs. 35). 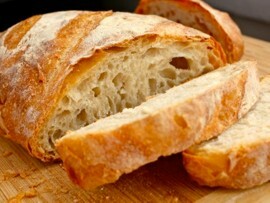 As much as I enjoy fresh warm bread, it can never satisfy the inner cravings of the spiritual man. Only Jesus can do that. I’ve got a feeling that’s why one of my heroes, David, told us, “Oh, taste and see that the Lord is good!” (Psalm 34:8). He’s the only One who can bring deep and lasting peace and joy. We don’t obtain those qualities as a result of following some rules or going through an ancient ritual. No, they are byproducts of partaking of the true bread of life, Jesus. This entry was posted in Scriptural Perspective and tagged Jesus the bread of life, John 6:27, John 6:33, John 6:35, Psalm 34:8. Bookmark the permalink. This is great to keep in mind while trying to take in less of the earthly bread… only Jesus truly fills!